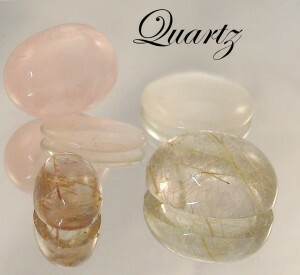 Quartz is a “catch all” name for all Silica based gems in the jewellery trade. Purple Amethyst, Yellow Citrine, Bi-coloured Ametrine, Green Prase, Pink Rose Quartz and the needle included Rutilated or Toumalinated Quartzes are but a few of the specialty names applied to this ubiquitous material. Quartz naturally grows as a transparent crystal. The larger sizes, if they are tinged with colour, are cut into individual gems. The smaller sizes are used as display items in clusters or if they are smaller yet, set in panels of Druzy Quartz.. The very smallest crystals usually bond together as they are formed into an opaque or barely translucent mass. 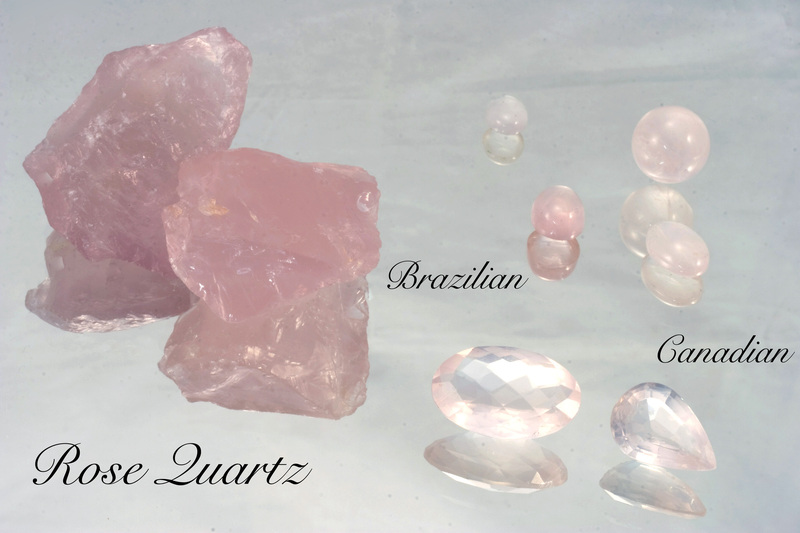 This is the form Rose Quartz most often takes although there are a few clear faceted specimens I have seen that were truly magnificent. The included gems are usually cut “en cabachon” to show the needles of either Golden Rutile or Black Tourmaline. Although Tourmaline comes in every colour of the rainbow, rarely have I seen any colour of needles except black although I imagine they are out there. Quartz came into the scientific world on two fronts. Because of its unusual Piezoelectric properties, it is used in electronic timing circuits. If you apply a voltage to a crystal, it moves. And that movement is very dependably calibrated to the ratio of how much voltage over the dimensions of the material. Unstable natural crystals display the reverse of this same phenomena. If you squeeze or strike it, it responds with a voltage. Some Chiropractors/Accupressurists use a shocking “clicker”, basically a spring loaded device that plunges a slug against a crystal, to “treat” their clients with “natural energy”. The other place Quartz participates in science is as photon tubes in lasers. Since Quartz is a very pure source of Silica, scientists decided to grow or synthesize crystals to exact sizes and degrees of purity. The ease which raw material is found and manipulated contributed greatly to its choice. Later, synthetic Ruby and other gems were used. Now, the newest generations use gases instead of solids inside a tube. Although we do not stock or sell lasers or acupressure shocking gizmos, we do have Quartz watches, crystal specimens and a wide variety of Quartz jewellery set in both Sterling Silver and Gold. Why don’t you come in soon and take a look?